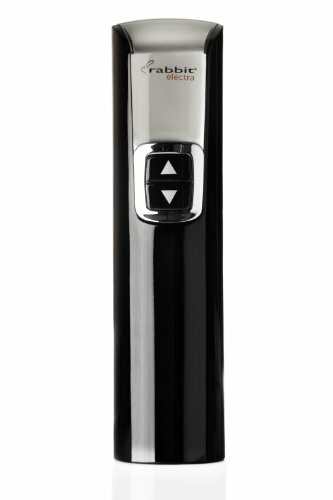 The Rabbit Electra Corkscrew is a modern, stylish addition to a home bar or kitchen. This innovative tool removes the cork from a bottle on contact and automatically ejects it from the corkscrew. Works on all cork types, including plastic corks. The corkscrew opens up to 30 bottles on a single charge. Features a built-in foil cutter for added convenience. A/C charger included. This innovative tool removes the cork from a bottle on contact and automatically ejects it from the corkscrew. Works on all cork types, including plastic corks. The corkscrew opens up to 30 bottles on a single charge. Features a built-in foil cutter for added convenience.